Can Dobrolet succeed where other low cost carriers in Russia have failed? p>Russia’s new low-cost carrier Dobrolet, whose name is Russian for “good flight” has finally taken to the skies. The airline, a subsidiary of Russian national carrier Aeroflot began flying between Moscow and Crimea in June and will launch two additional routes – between Moscow and Perm and Moscow and Volgograd – in August. Flights between Moscow and Crimea range in price from 999 rubles (about $29) to 3,499 rubles (about $102). The cheapest tickets to Perm and Volgograd will also be 999 rubles. The fare covers one piece of carry-on luggage under 22 lbs (10 kg). Any additional luggage and services, including meals on board and seat selection, will be charged separately. By the end of the year, the airline's network of routes will be expanded to 10 destinations inside the country; by 2018, this number should rise to 40. In addition, starting from 2016, Dobrolet plans to launch foreign routes. The press service did not name any possible foreign destinations, but according to Russian business daily Vedomosti, the list of intended cities includes Tel Aviv, Istanbul and Barcelona. "By 2018, the company's fleet will consists of up to 40 aircraft and Dobrolet will carry 10 million people a year, which will put it on the list of Russia's 10 biggest airlines," the press service representative said. Aeroflot's move to launch a low-cost subsidiary is in line with the standard development strategy of major European airlines. Lufthansa's support helped its subsidiary Germanwings break into the European budget airline market and Spain's national carrier Iberia launched its low-cost subsidiary, ClickAir, in 2006. Two years later, ClickAir was merged with its competitor, Vueling, with Iberia retaining 46 percent in the new company. The merger proved a success: Vueling is now Spain's second biggest airline in terms of the number of passengers carried. "Global experience shows that budget airlines are very popular on passenger air travel market," the Dobrolet press service representative said, adding that in Europe, budget airlines account for 38 percent of passenger traffic; in North America, 30 percent; in South America, 27 percent; in Asia, 17 percent, and in Africa, 9 percent, and those figures grew every year. Despite the popularity of low-cost travel, the model has not yet been successful in Russia. Dobrolet is the third attempt to set up a low-cost airline in the country. Two previous discount airlines, Sky Express and Avianova, went bankrupt in 2011. Experts attributed their failure to high costs, including taxes and airport fees, and the lack of a legislative mechanism allowing discount carriers to make money. In particular, the Russian Air Code in place at the time prohibited the sale of non-refundable tickets and required airlines to serve food onboard. Recently adopted changes to these regulations have become a key in estimating Dobrolet’s potential for success, according to Anatoly Khodorovsky, deputy head of the Region investment company. Khodorovsky says that with the legislative changes, Dobrolet will be able to operate according to a classic discount airline business model, making money on additional services and cutting costs. 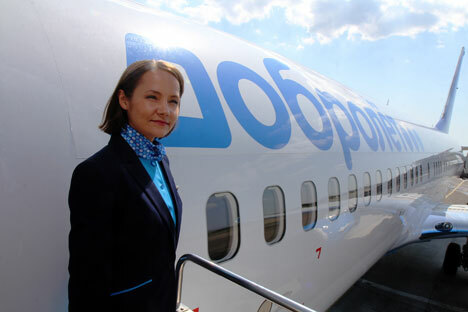 However, Dobrolet’s chances for success are mostly thanks to the support of Aeroflot, according to the expert. Said Khodorovsky, "a fundamental condition for reducing costs is a new and uniform fleet of aircraft." And by the end of 2014, Dobrolet's fleet should consist of eight Boeing 737NGs, which the company has been able to purchase thanks to support from Aeroflot. In addition, Dobrolet receives fueling services at Aeroflot rates, according to Oleg Panteleyev, head of research at the Aviaport agency. Dobrolet’s ability to expand internationally will also rely on the cooperation of the state, explained Anatoly Khodorovsky. The new airline will have to have new intergovernmental agreements for each route it intends to fly.